IOC/Retirement In development (reportedly being mass produced)/N.A. Click here to watch the first test launch of the Polaris-2 ballistic missile. The Polaris-2 marks a significant advancement of the DPRK’s ballistic missile launch capabilities. As the DPRK’s longest-range solid fuel missile,[vi] the Polaris-2 could likely encroach upon Japan’s exclusive economic zone when fired at full range. [vii] Additionally, the tracked TEL from which the Polaris-2 is launched marks a technological milestone. Rather than being limited to the DPRK’s estimated 724km of paved roads, the tracks expand the Polaris-2’s mobility to more than 24,000km of unpaved roads, as well as off-road terrain. [viii] This mobility greatly enhances the concealability of the Polaris-2, and, in combination with its nuclear capability and extended range, demonstrates an ever more lethal ballistic missile program. [i] The DPRK’s state-owned news organization, Korean Central News Agency, claims the Polaris-2 possesses “position control and guidance” capabilities. 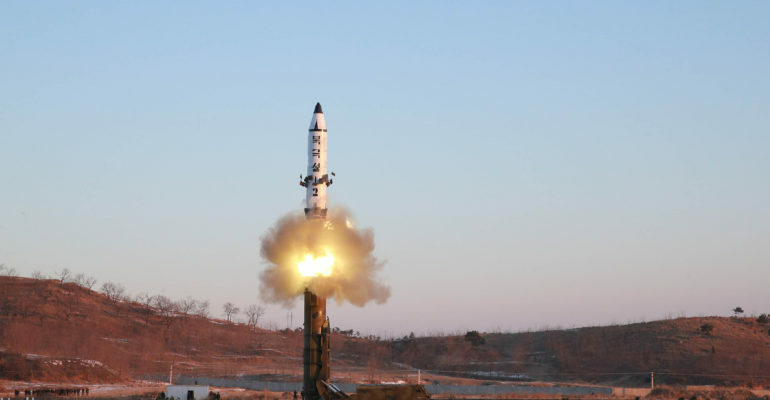 See https://www.nknews.org/2017/02/n-korea-successfully-test-fired-medium-long-range-missile-kcna/. [ii] John Schilling, “The Pukguksong-2: A Higher Degree of Mobility, Survivability and Responsiveness,” 38North, January 13, 2016, http://38north.org/2017/02/jschilling021317/. [iv] Choe Sang-Hun and David E. Sanger, “North Korea Claims Progress on Long-Range Goal With Missile Test,” New York Times, February 13, 2017, https://www.nytimes.com/2017/02/13/world/asia/north-korea-missile-launch-success.html?_r=1. [v] Norman Friedman, “What Would Deter North Korea’s Nuclear Weapons?” United States Naval Institute, Proceedings 142.11 (November 2016): 90-91. [vi] Tara Copp, “Pentagon: North Korean missiles pose ‘clear, grave threat’ to US,” Stars and Stripes, February 13, 2017, https://www.stripes.com/news/pacific/pentagon-north-korean-missiles-pose-clear-grave-threat-to-us-1.453833. [vii] Ankit Panda, “It Wasn’t an ICBM, But North Korea’s First Missile Test of 2017 Is a Big Deal,” The Diplomat, February 14, 2017, http://thediplomat.com/2017/02/it-wasnt-an-icbm-but-north-koreas-first-2017-missile-test-is-a-big-deal/.